I've been thinking about this because now that I have little kids, I've realized that I have to give up a lot of this sort of control in my life. When I unpacked Peregrine's books I carefully sorted them all- board books on the top shelf, books of similar size together, all the Golden Books in a row, and so on. I happily thought how nice it looked and how he would just get out one at a time and then carefully put it back where he found it. Ummmm, it hasn't exactly worked out that way. And I'm realizing that if I want him to love books like I do then he needs to be allowed to get them out and read them. So, I've been letting go of my expectations about how his book shelf should look. If I don't then I'm going to be annoyed all the time, and so is he. Today my sisters, nieces, and nephew came over to decorate gingerbread houses. In past years I have spent hours meticulously gluing bits of candy on my house, and everyone always teases me about mine having to be perfect. What can I say? I enjoyed tiling the entire roof with Chex cereal, building pretzel fences, drizzling dozens of icicles off the eaves and paving the pathway one candy at a time. That was fun for me and it was a bonus that my gingerbread house was always beautiful. Well, I decided that if this was going to be fun for Peregrine then I needed to let him do what he wanted with it. 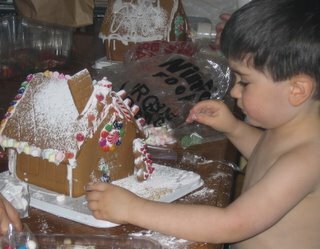 Of course, mostly he just wanted to eat the candy, but he also stuck some onto his house. He even got creative and realized that if you lick the candy enough it just might stick by itself. Nice. And you know what? I think his house is beautiful, even if there are gumdrops on one side of the roof and something else on the other. It's beautiful because it was something we enjoyed doing together. So I'm trying to let go of some of my tendencies toward perfectionism, and I find that as I do I enjoy life more, and so does my boy. I feel a new freedom to see life through his eyes and it's so fresh and simple and full of wonder. After all, it doesn't matter to him if his peanut butter covers every square millimeter of his bread. But it does matter if his Mama is having a good time and being joyful as I go about my day. And hey, maybe I'd have more time to read to him if I'd quit organizing the bookshelf. i have really enjoyed reading your stories about you and your kids becca, you have such a beautiful family!